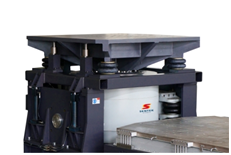 Sentek Dynamics can provide a wide-range of standard head expanders and custom fixtures for applications requiring a larger mounting area, vertical mounting or simultaneous testing of multiple devices under test (DUTs) in sizes up to 1500 mm (60 inches). FEA is used to ensure an optimal design and superior performance. Standard material is Magnesium with Aluminum an affordable option. Head expanders (square or round) for working frequencies ranging from 350 to 2000 Hz. Standard head expanders include stainless steel inserts for enhanced strength and durability. 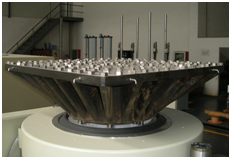 Head expanders with load support or load support and guidance are designed for testing large, heavy items for demanding transportation test profiles while providing additional load support and restraint. Head Expanders with load support guidance allow DUTs with large footprints to be safely mounted and tested on the shaker, eliminating the risk of damage to the shaker guidance (suspension) system. Custom fixtures can be designed and manufactured to meet unique customer requirements. 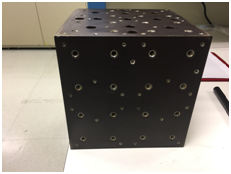 Custom cube, L or T type fixtures are many times used by customers without a slip table for 3-axis testing. A list of standard head expanders follows. For custom head expanders and fixtures please contact the Sentek Dynamics sales office.